The proud moment Megastar featured me in their top 5! An international competition hosted by Usher Raymond himself and I am proud to say, finished in the top 50 out of 100,000+ submissions! Thanks to all those who took the time out of their day to vote, share and support me to that level! Thank YOU! 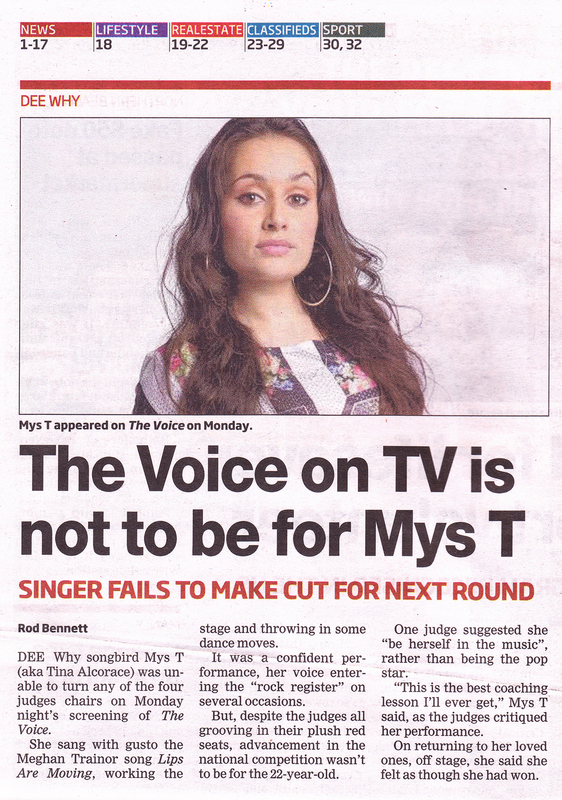 DEE Why singer Mys T says she is nervous but focused going into Monday’s night Blind Audition on The Voice. Monday night’s screening is at 7.30pm on Channel 9. Mys T (aka Tina Alcorace) turned down doing a masters degree to pursue her singing dream. “I talked about it a lot with my parents and we decided I should take a year off to concentrate on this,” she said. It is her debut on the highrating show. Recently, Mys T embarked on a Kickstarter campaign to assist in making her first album, MysTified. “I don’t like asking for money but I decided to go for it,” she said. To contribute to Mys T’s campaign go to www.kickstarter.com/projects/384604731/ mystified-fund-mys-ts-firstofficial-album. 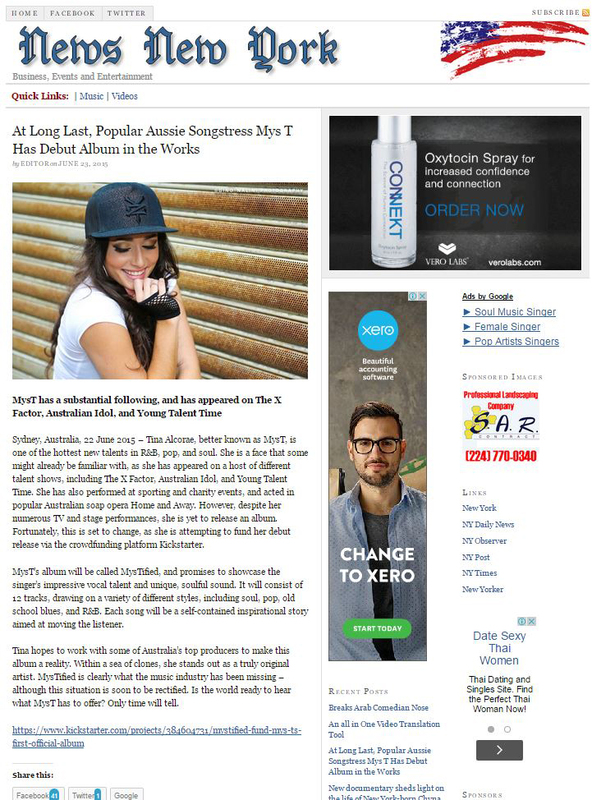 Sydney, Australia, 22 June 2015 – Tina Alcorae, better known as MysT, is one of the hottest new talents in R&B, pop, and soul. She is a face that some might already be familiar with, as she has appeared on a host of different talent shows, including The X Factor, Australian Idol, and Young Talent Time. She has also performed at sporting and charity events, and acted in popular Australian soap opera Home and Away. However, despite her numerous TV and stage performances, she is yet to release an album. Fortunately, this is set to change, as she is attempting to fund her debut release via the crowdfunding platform Kickstarter. MysT’s album will be called MysTified, and promises to showcase the singer’s impressive vocal talent and unique, soulful sound. It will consist of 12 tracks, drawing on a variety of different styles, including soul, pop, old school blues, and R&B. Each song will be a self-contained inspirational story aimed at moving the listener. Tina hopes to work with some of Australia’s top producers to make this album a reality. Within a sea of clones, she stands out as a truly original artist. MysTified is clearly what the music industry has been missing – although this situation is soon to be rectified. Is the world ready to hear what MysT has to offer? Only time will tell.